No matter what size of shed you’re after, the same five steps will take you from plan to perfect choice. Work out and measure the space where you plan to locate your shed. Write down all your measurements so you can draw up an accurate plan. Note potential problems, such as overhanging trees, and anything under the proposed shed footprint, especially pipes and conduits. Note all nearby buildings, walls and drainage. These are all important for council approvals. Choose a site that takes advantage of what’s already there. Garages, carports and large sheds can take advantage of pre-existing access to save money on new driveways, fences, etc. Most sheds are built onto a concrete slab. Does your site have space to form one far enough from boundary walls and is there adequate access to the site? Write a list of everything you’ll want to use the shed for. Include all your shed furnishings, such as shelving, benches, and work tables. Work out roughly how much space each of these will take up. Consider everything that won’t be stored on shelves like domestic appliances or machinery, mowers, ladders, tool chests, bikes, cars, boats and any farm equipment or plant. For farm machinery and plant, calculate the turning space required to bring in heavy attachments without removing them first. Will you need power and lighting supplied to the shed itself? What about water, sewage and gas, provision for Wi Fi or data ports? If using the shed as a workspace, you will require at least natural light. Clear roofing panels and solar lighting are options if you don’t want to connect the shed to mains electricity. Suspending tools and items from the shed walls or roof is a great way to maximise storage. If you plan to be attaching pulleys, calculate the loads you expect to lift. A hoist, storing tall items or a mezzanine level will all require extra-height walls. If you plan to be welding or engaged in fume-producing work, cross-ventilation or installing a ventilator is essential. Rooftop ventilators can help regulate heat if you plan to use your shed as a workspace. Expensive tools and equipment are worth the cost of additional safety measures, such as floor anchors (which can be retrofitted into a pre-existing slab), roller-door security locks and shed alarms. Storing vehicles that are hard to reverse? If there’s space behind the shed, doors on each side of the shed can be used for a drive-in, drive-out. Calculate the best shed size for your needs and then add some. 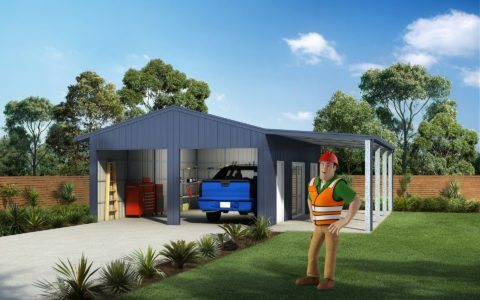 A shed or garage bigger than what you need or have calculated always comes in handy. Regrets only happen when your shed ends up too small. Draw up a plan on paper of your proposed shed size and then position all the things inside the space to see how it will fit. If you plan to be working in your shed, you will want space to move around your projects – especially if you will be working on a car or boat – you’ll need space to open the doors. You may need to consider adding an extra meter of width. Look for alternative storage solutions, such as hanging bikes from hooks on the walls, lifting small boats above head-height with pulleys and storing timbers and ladders across rafters. You may require a taller shed for the most economical use of your floorplan: many designs come in variable wall heights. If your shed will be used for industry or agriculture, take the time to future-proof it as much as possible. And add any extras you desire. Water tanks can make use of the drainage from the shed roof and will help a larger structure pass council approval. Match your shed to the house or garden colour scheme, or else make it into a feature in its own right. You can also decide on the angle of the roof pitch and trims for the shed to achieve a range of designer looks. For larger sheds and garages with roller doors, a personal access door at the side or sliding doors can make life a lot easier when you just need to pop in and out to grab something. An awning or carport can add useful protection and workspace for minimal additional cost. Start shopping and request a quote! Contact the Accredited Ranbuild dealer in your local area. Call them for a face to face consultation or request a quote on line and don’t forget to send them your specs. Quotes will vary depending on whether you want a DIY shed kit supply only, or supply and build so be sure to stipulate this when requesting a quote. It’s probably worth checking with your local council about the approvals you’ll need before buying and building, just so you are across the process and no nasty surprises come your way.